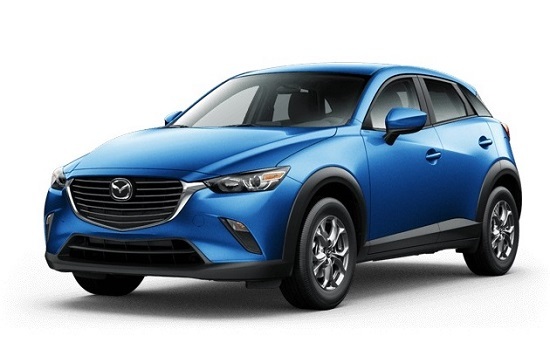 The 2016 Mazda CX-3 is a whole new vehicle for this year, offering Palm Coast and Port Orange drivers cutting-edge performance compared to competitors like the 2016 Honda CR-V. With stronger standard features, superior efficiency, and a much lower starting price, the 2016 Mazda CX-3 is the only crossover that is worthy of your consideration. 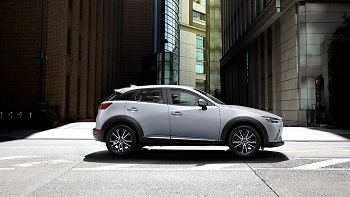 The 2016 Mazda CX-3 doesn’t spread its features out over numerous trim levels; instead, it offers three trim levels that are each packed with a stunning level of technology. 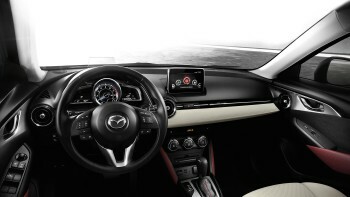 Sport: Starting at $19,960, even the entry-level Mazda CX-3 includes a rearview camera for confident reversing, a push button ignition system, voice controls, a 7-inch touchscreen interface, and a six-speaker audio system. It’s one of the best-equipped standard models in the segment. Touring: Starting at $21,960, the Touring trim makes advances in terms of both comfort and safety. A leather-wrapped steering wheel and shift knob helps ensure that driving feels relaxed at all times, while heated front seats keep you toasty. There’s even an advanced blind-spot monitor with rear cross-traffic system. Grand Touring: Starting at $24,990, your top-of-the-line CX-3 boasts state-of-the-art technology as standard, including adaptive LED headlights, satellite navigation, a heads-up display, and a seven-speaker Bose audio system with both HD radio and satellite radio. In contrast, the 2016 Honda CR-V will demand a minimum of $23,595 just for the entry-level model — over $3,600 more than a standard CX-3 and only just over $1,000 less than a top-end CX-3. For that price, you’ll receive a rearview camera and 60/40-split rear seat, both of which are offered with the entry-level CX-3. From there, models work their way up to the Touring, which will cost Palm Coast and Port Orange at least $31,945. 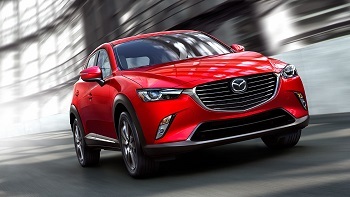 As an all-new model, the 2016 Mazda CX-3 benefits from one of the most cutting-edge powertrains around: a 2.0L four-cylinder engine paired with an advanced six-speed automatic transmission system. You will enjoy 146 hp and 146 lb-ft of torque for a nimble and responsive drive under all conditions, all while making 29 mpg in the city and 35 mpg on the highway with front-wheel drive or 27 mpg city and 32 mpg highway with all-wheel drive. 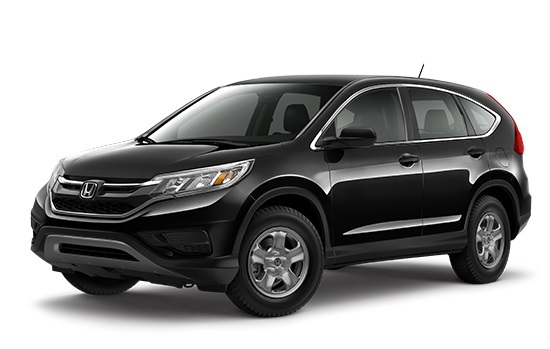 The 2016 Honda CR-V packs a much larger and thirstier engine. 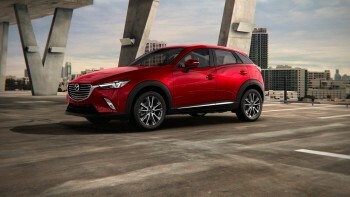 Its 2.4L direct injection in-line 4-cylinder makes 185 hp and 181 lb-ft of torque; however, a curb weight of 3,358 pounds vs. the CX-3’s 2,809 pounds renders that excessive output less important than you might think. For that power, Palm Coast and Port Orange drivers are forced to sacrifice efficiency. The CR-V makes 26 mpg in the city and 33 mpg on the highway or 25 mpg city and 32 mpg highway with all-wheel drive, which is far less than the CX-3. When Mazda designed to 2016 CX-3, they went the extra mile to ensure that it offered premium materials and a whisper-quiet cabin, so that’s exact what Palm Coast and Port Orange drivers will find when they slip inside. It also boasts features that you won’t find in competitors like the 2016 Honda CR-V, such as the active driving display and head-up display, which provides driving information projected right on the windshield. Both the 2016 Mazda CX-3 and the 2016 Honda CR-V provide plenty of standard and available features, including leather seats, a rearview camera, and voice-activated controls. However, the 2016 CX-3 provides slightly more without making you pay extra for a higher trim. Entertainment: The 2016 CX-3 includes a six speaker sound system as standard, while the CR-V only provides a four-speaker option. Optional Features: Entry-level CX-3 models allow you to add features like a navigational aid, universal garage door opener, and remote ignition system, while the CR-V reserves them exclusively for higher trims. The 2016 Mazda CX-3 and the 2016 Honda CR-V are each designed for Palm Coast and Port Orange families, so it’s no surprise to find them equipped with plenty of active and passive safety features. These range from basic devices, such as anti-locking brakes, tire pressure monitoring systems, and traction control, right up to pioneering driver assistance technologies, such as adaptive cruise control and blind spot detection. However, only the CX-3 is available with adaptive LED headlights; your front lights will move intuitively with your steering, so you’ll enjoy precision illumination even while tackling tight corners. The 2016 Mazda CX-3 is one of the most promising crossover models around, and you can experience it for yourself at Are man she towards. For more information, just contact one of our team members today.